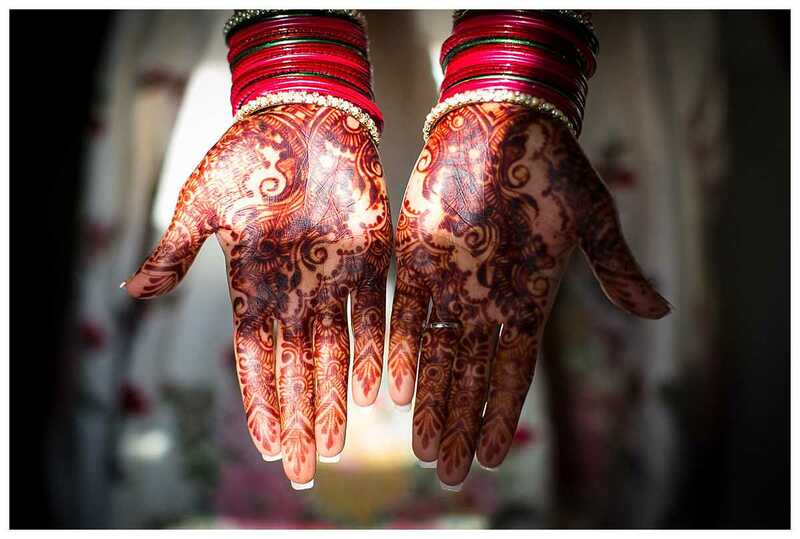 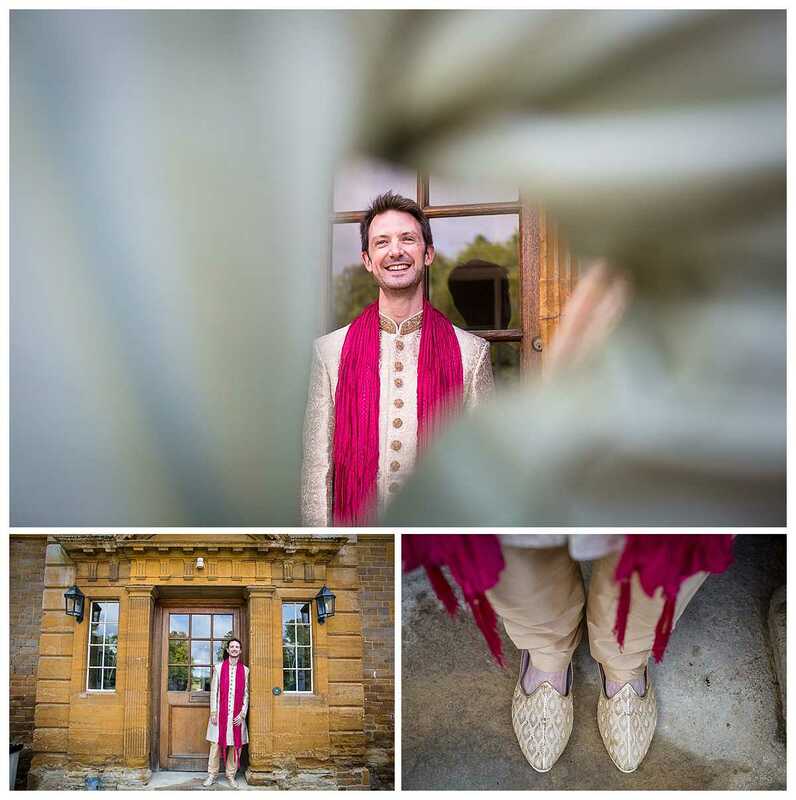 TRULY WONDERFUL, RELAXED INDIAN WEDDING WITH LOTS OF LOVE, LAUGHTER AND HUMOUR! 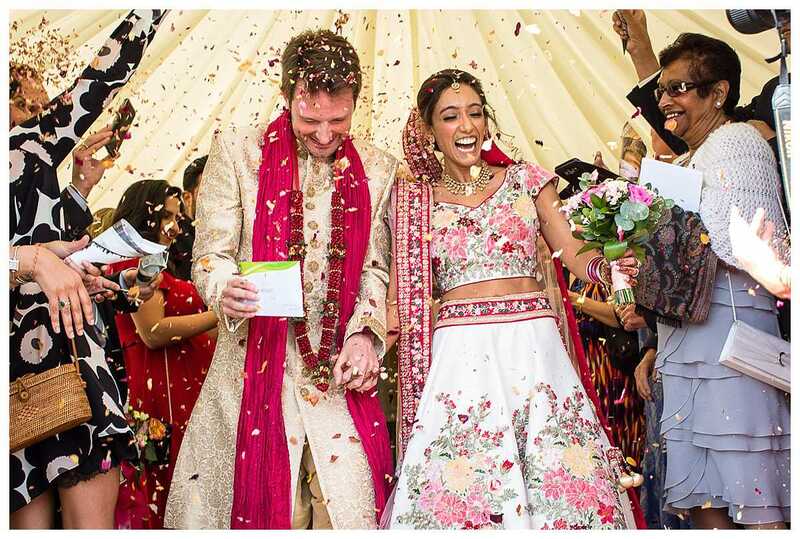 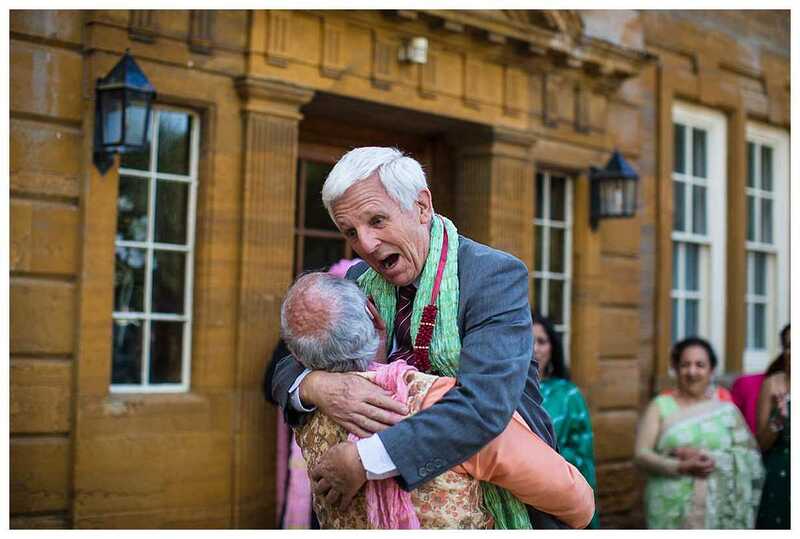 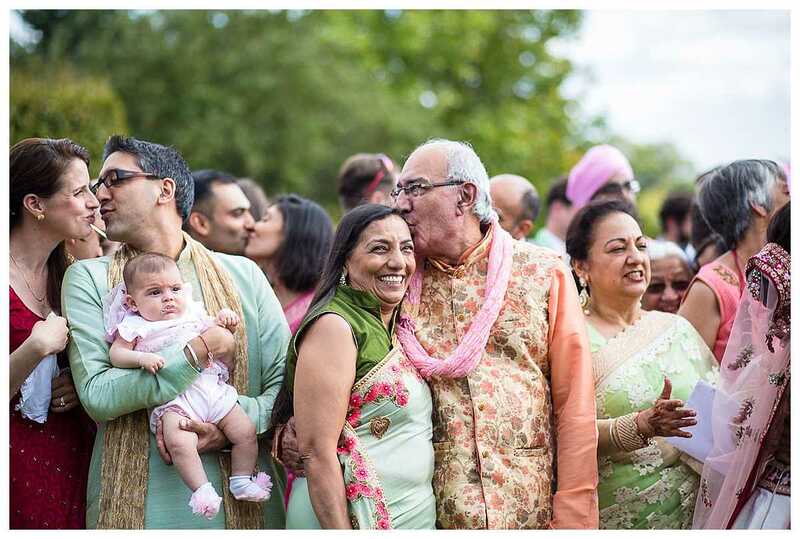 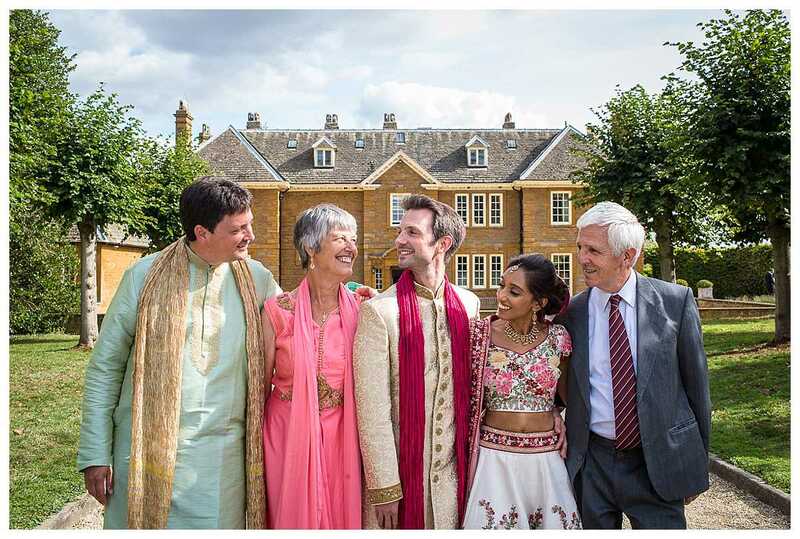 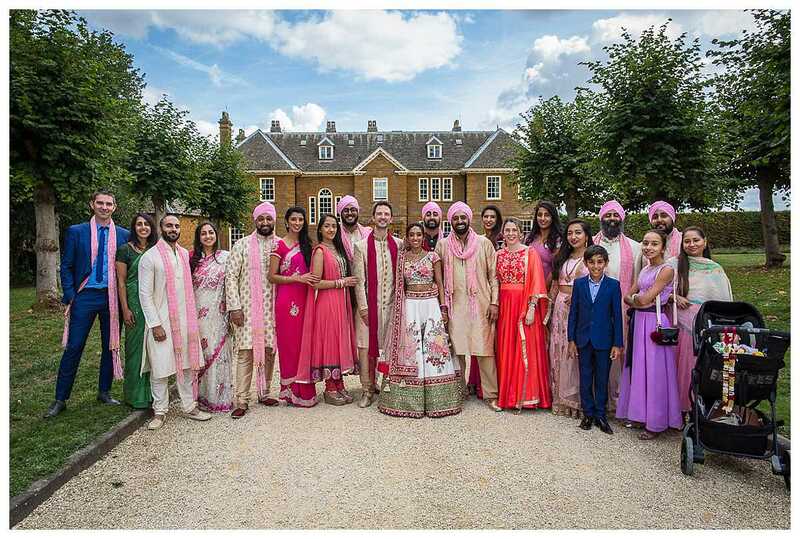 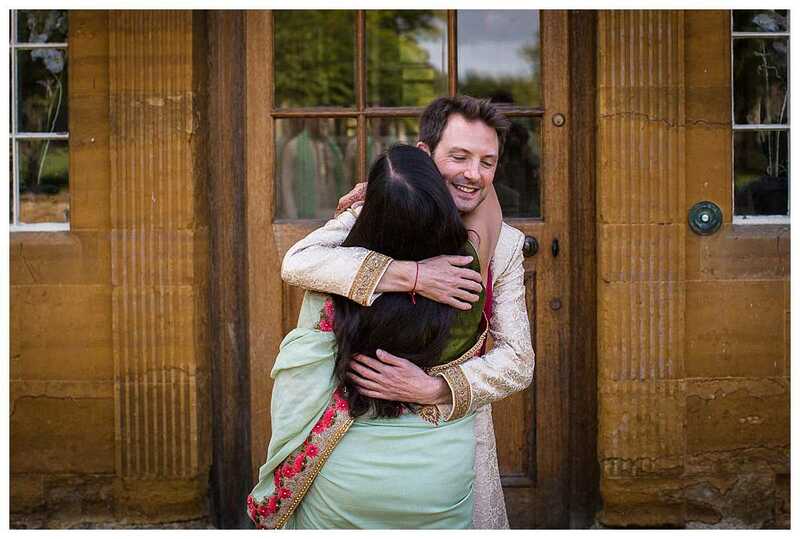 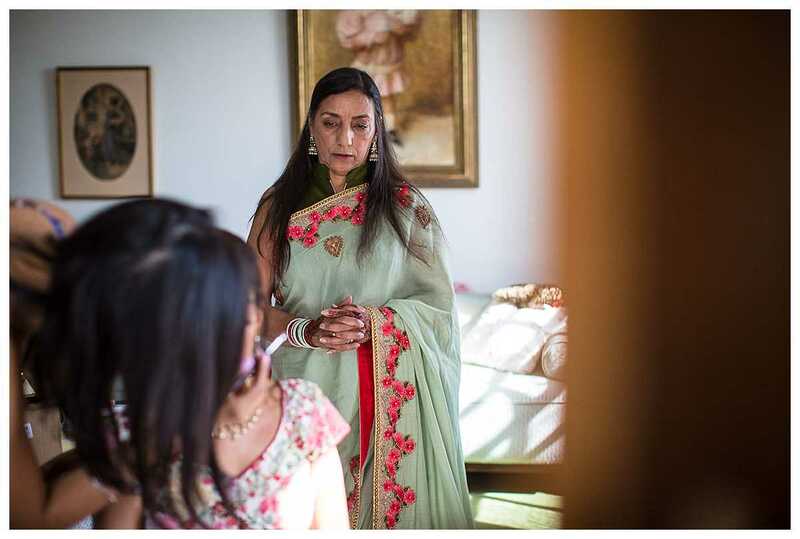 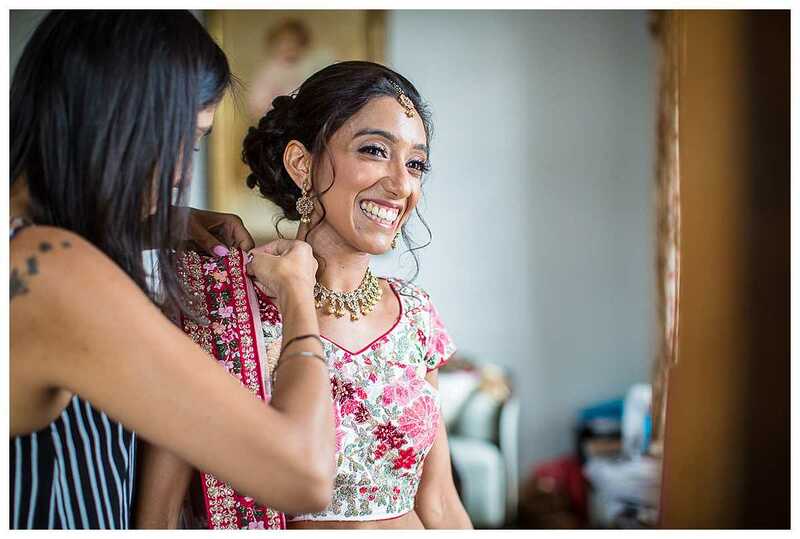 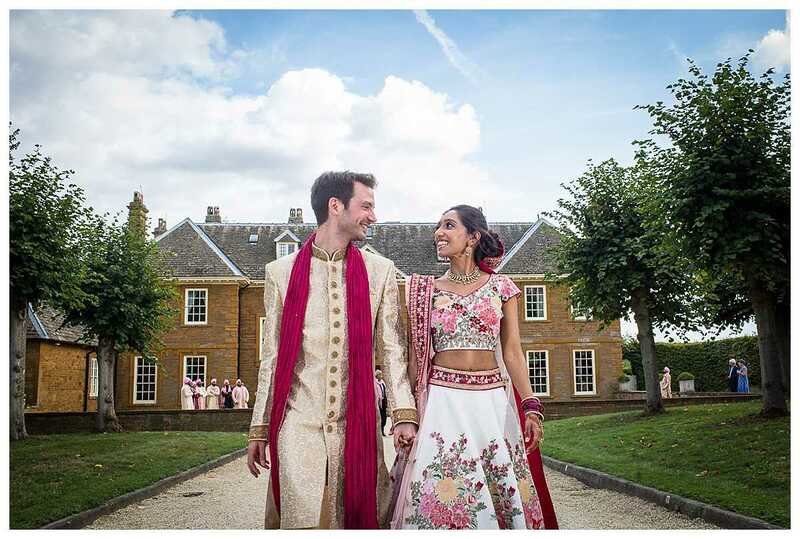 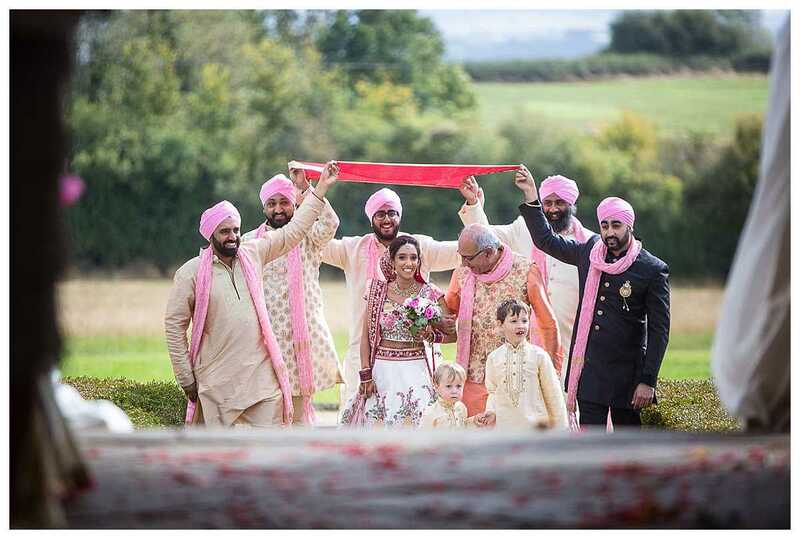 When Seema and David first got in touch with me about their relaxed Indian wedding in Bicester, I was so excited – they were planning such a fun autumnal wedding with an outdoor ceremony, lawn games and even their first dance in sumo suits! 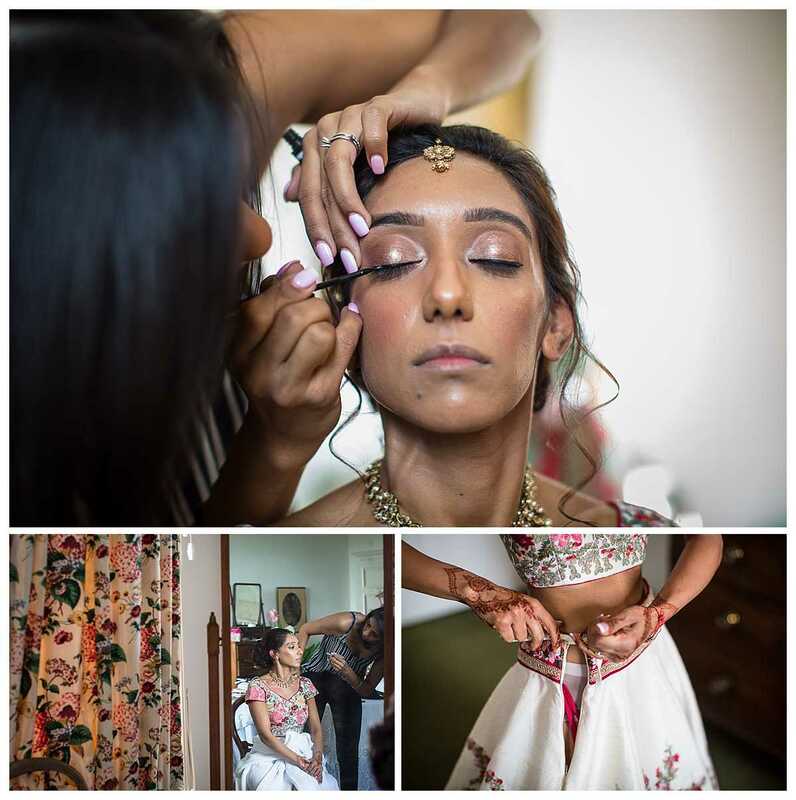 Seema and David are the most fun people and I couldn’t wait to shoot their wedding! 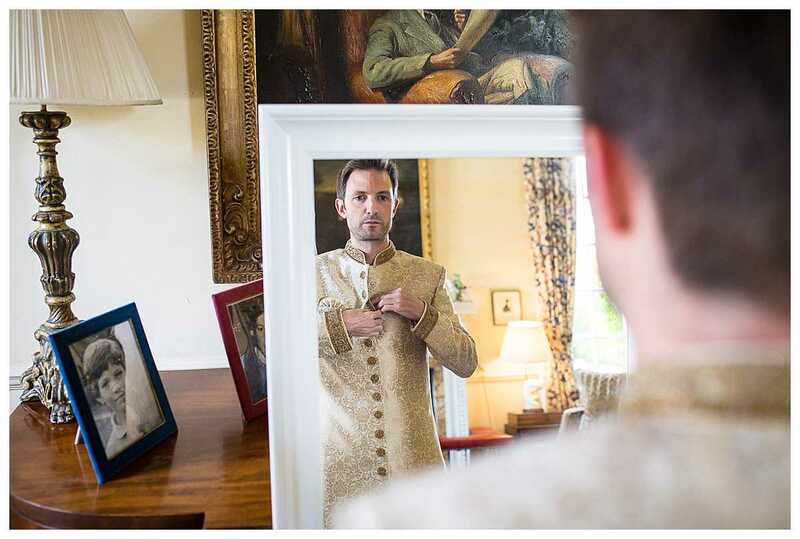 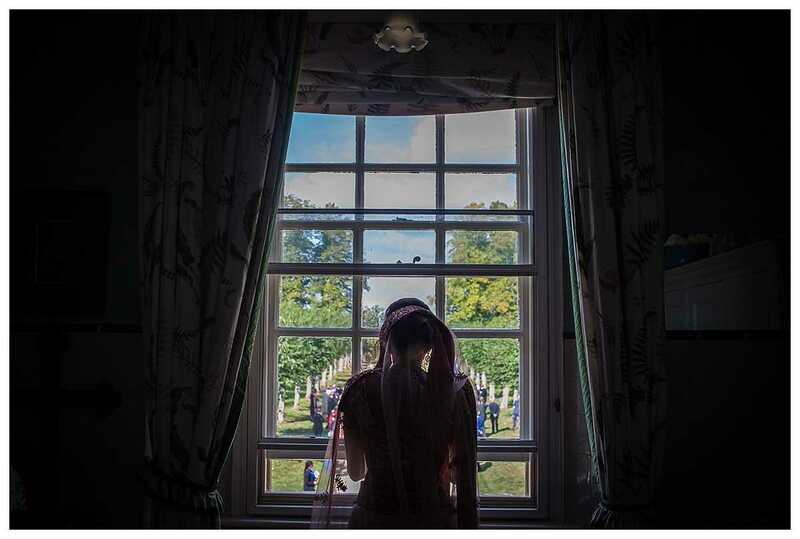 I began the morning in the Bridal Suite Poundon House, where the bride was getting ready. 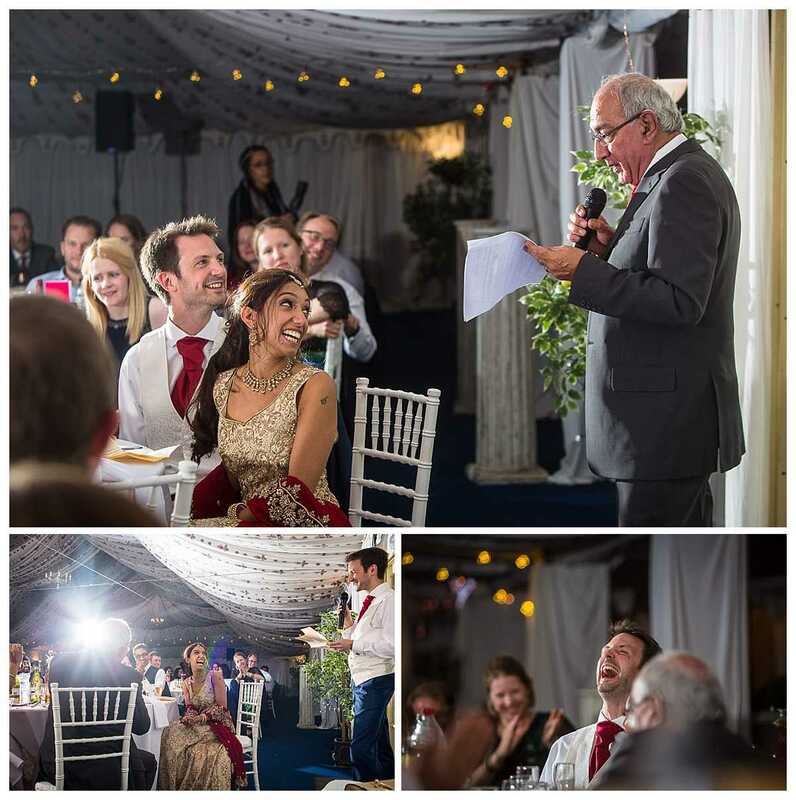 Seema so relaxed, writing her speech and everyone was in a good mood. 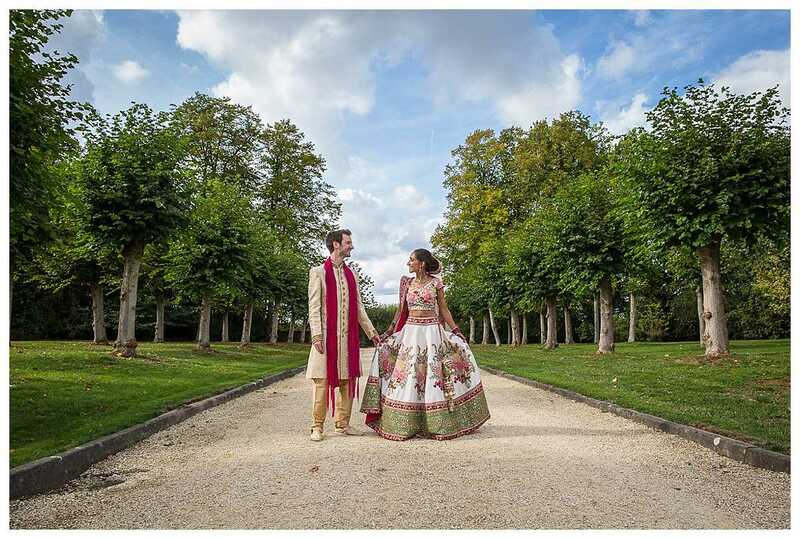 Seema wore an amazing typical Indian dress and David wore a traditional Kurta outfit and they looked so perfect for the occasion. 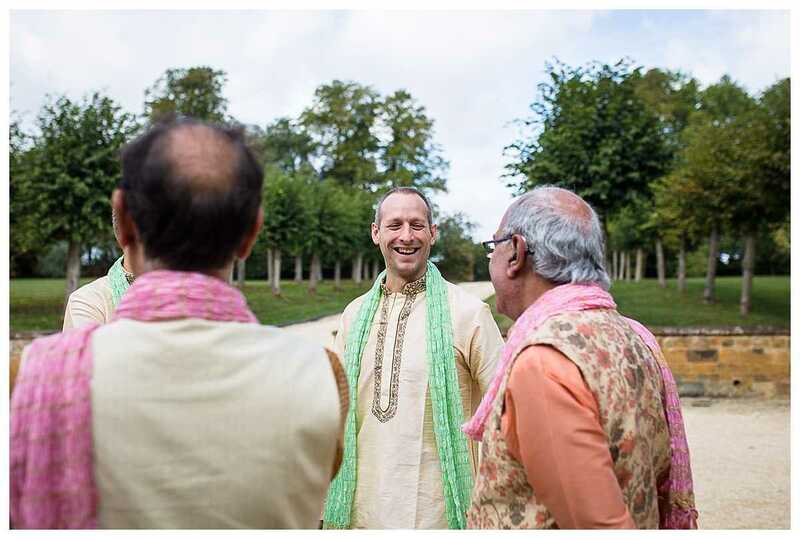 Just before the ceremony, David arrived in a traditional Indian manner to Poundon House on a ricksaw, with his two young nephews. 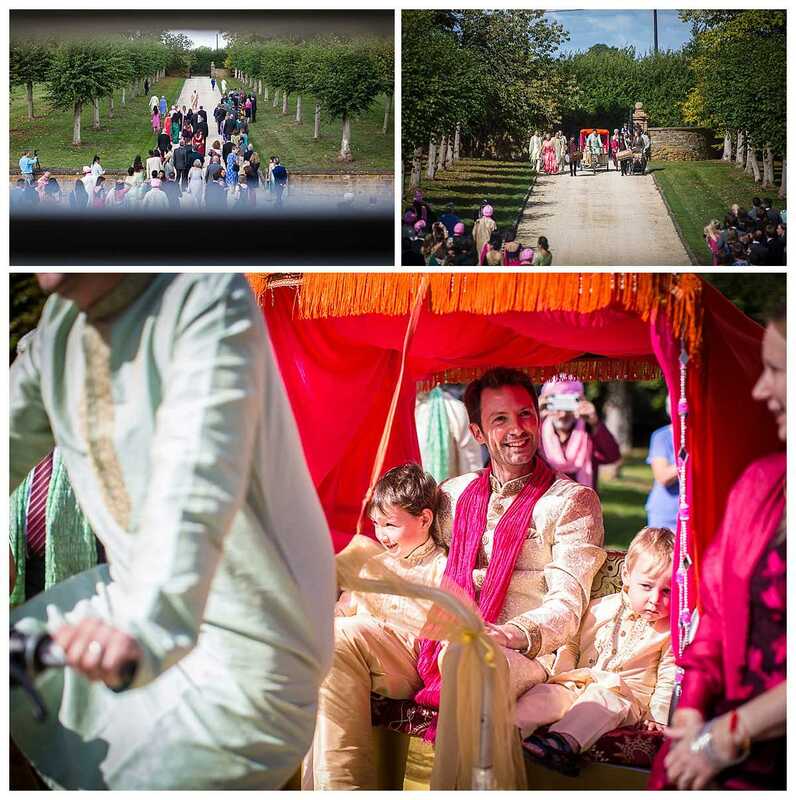 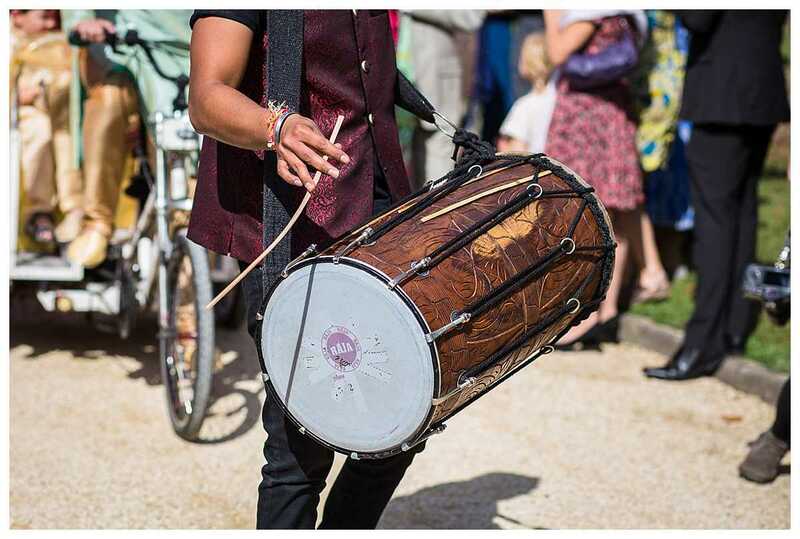 The ricksaw was peddled by David's brother and guests walked along side it with the incredible Dhol drummers - which got everyone into the wedding spirit! 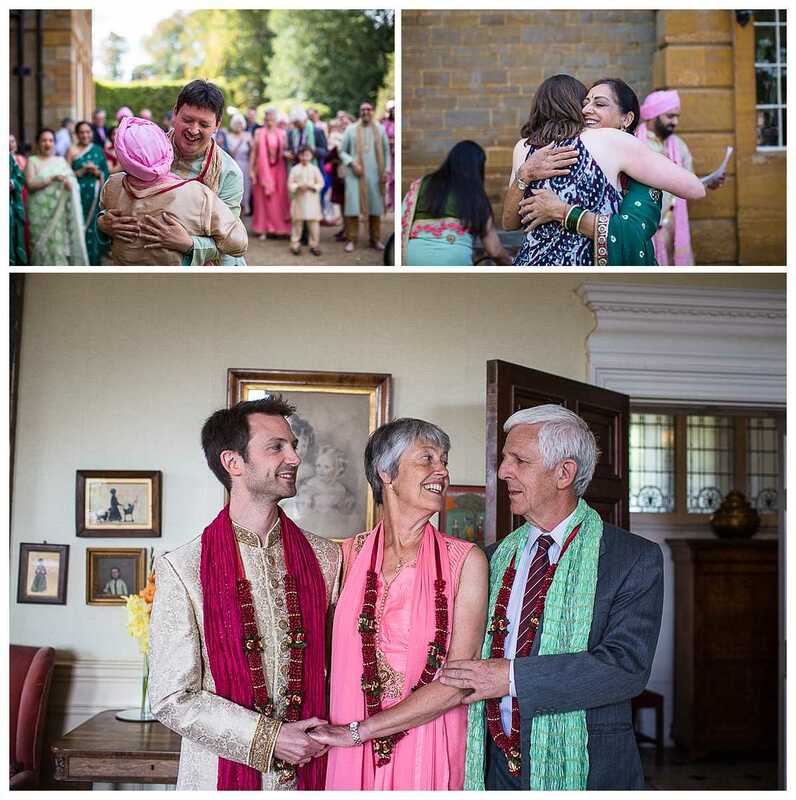 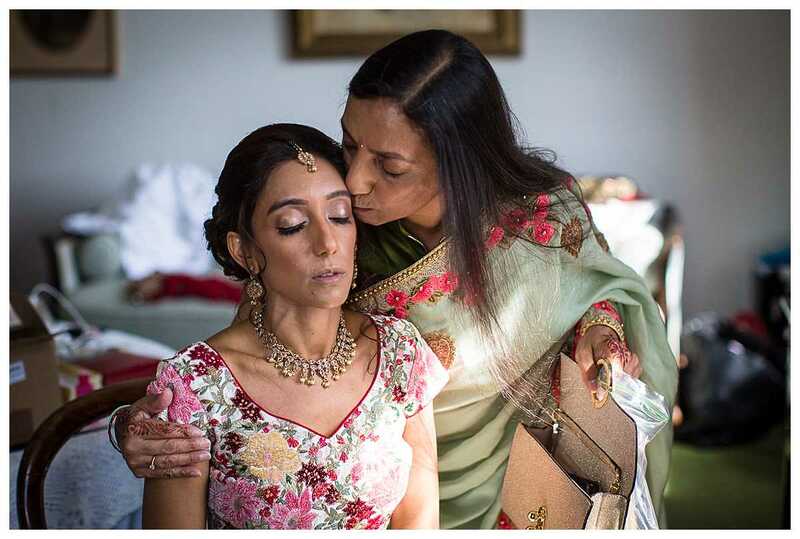 After the procession down the drive way of Poundon House, Seema's brother carried out the Mini which is the introduction of both families and exchanging garlands. 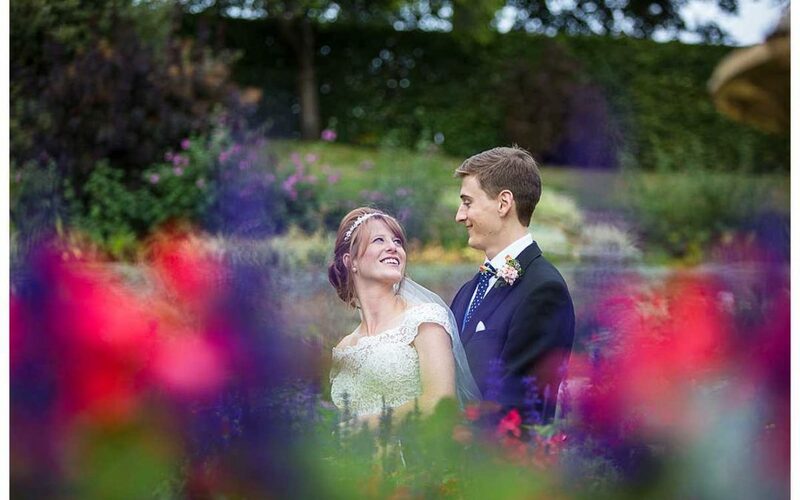 The wedding took place at Poundon House, under the canopy outside. 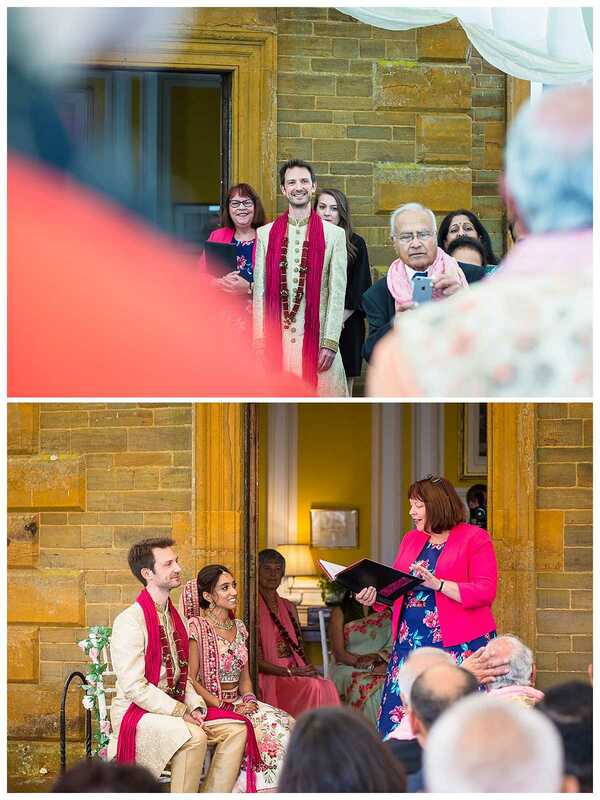 They had personal vows they wrote themselves, which was so beautiful. 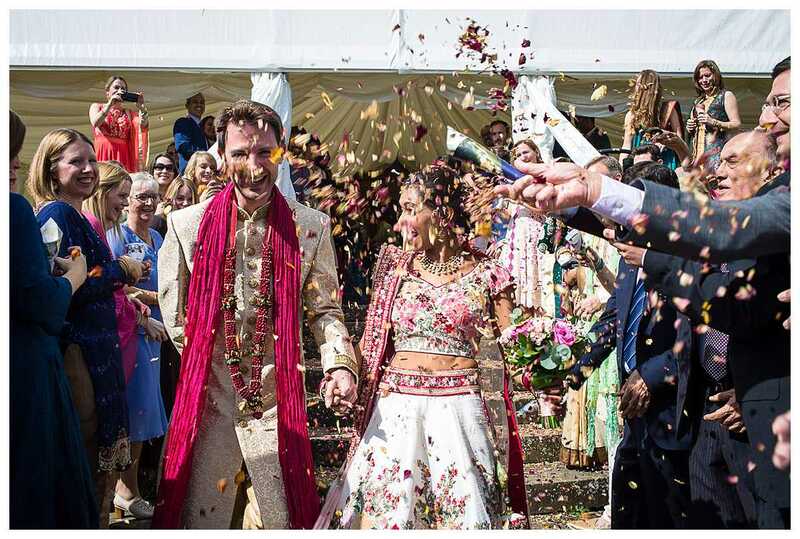 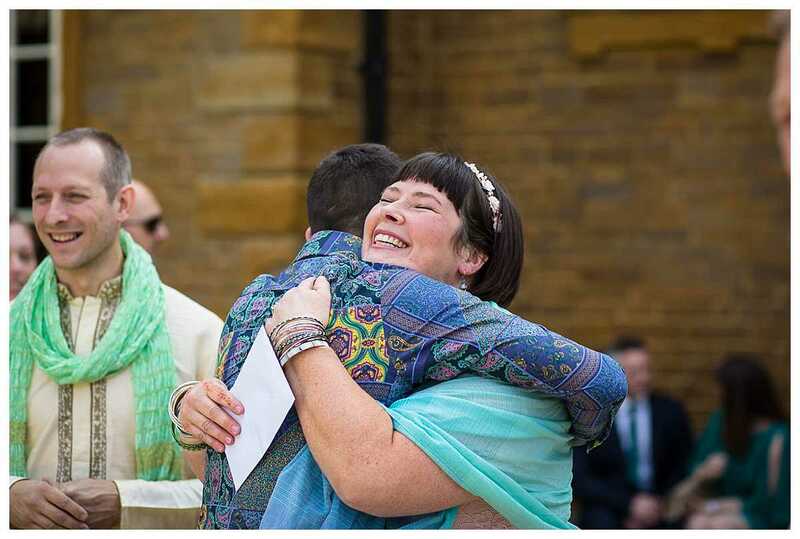 After the ceremony they walked down the aisle together and were showered with colourful confetti, greeted by their wonderful guests and then everyone relaxed and went for afternoon tea! 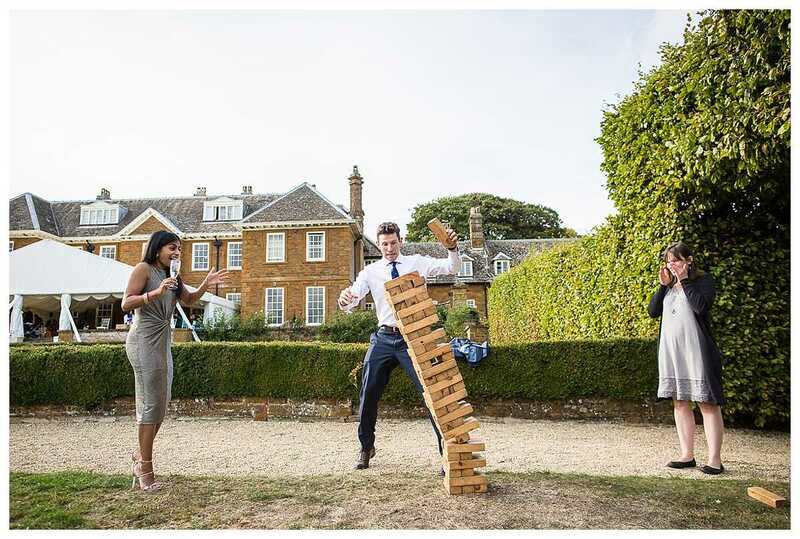 I thought this was an incredible idea with everyone having such an early start to the day. 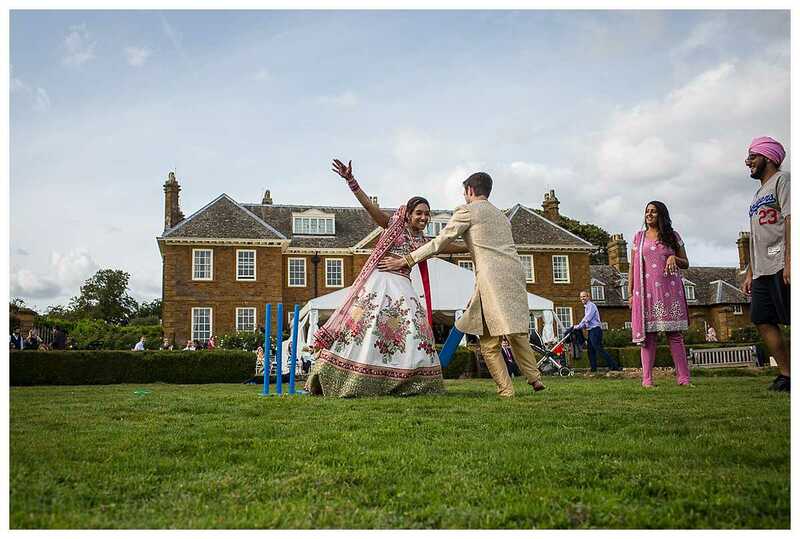 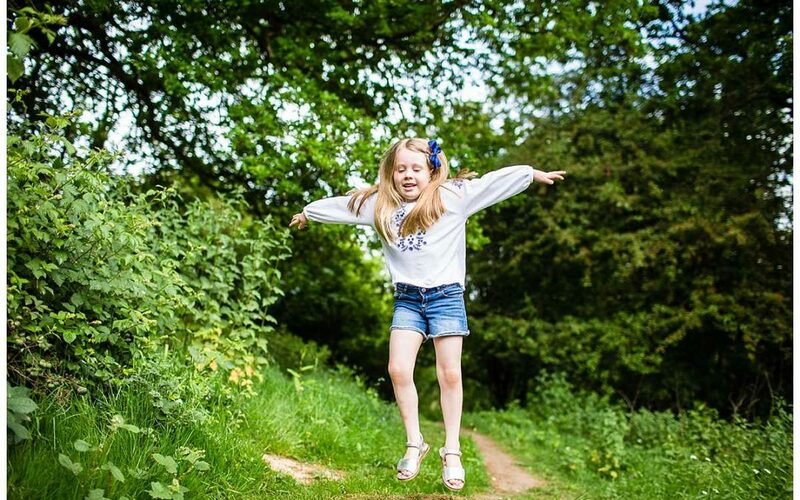 The wedding reception took place in the gardens at Poundon House, which was full of garden games for guests to play with or sit and watch and relax. 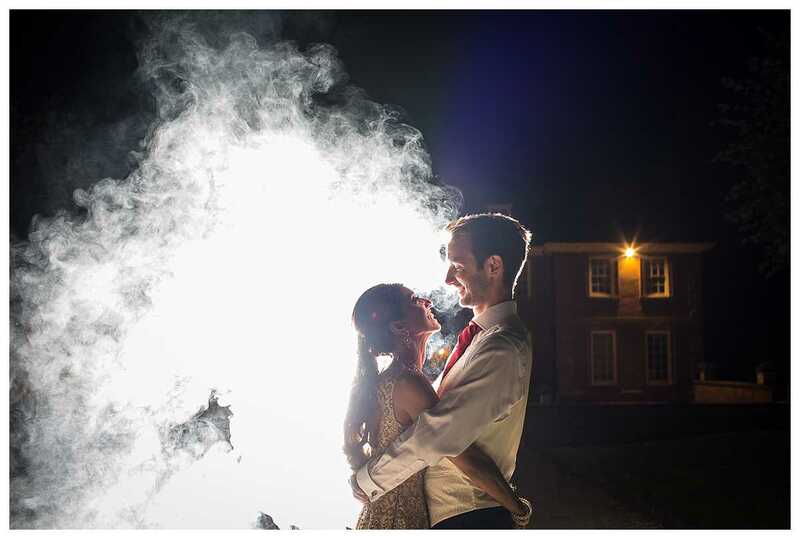 It was great to photograph! 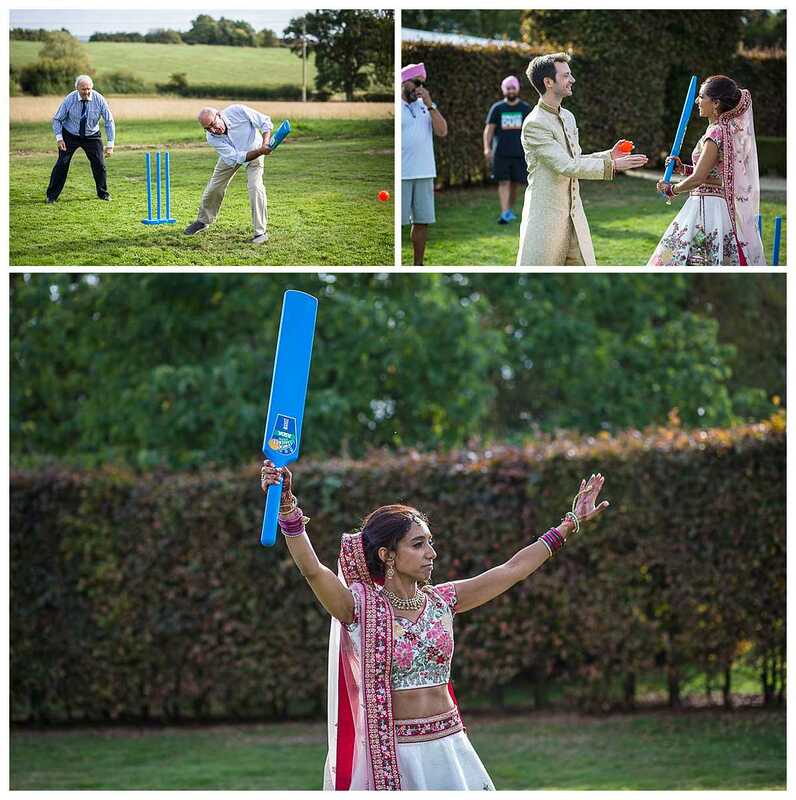 Seema and David got in on the cricket action too. 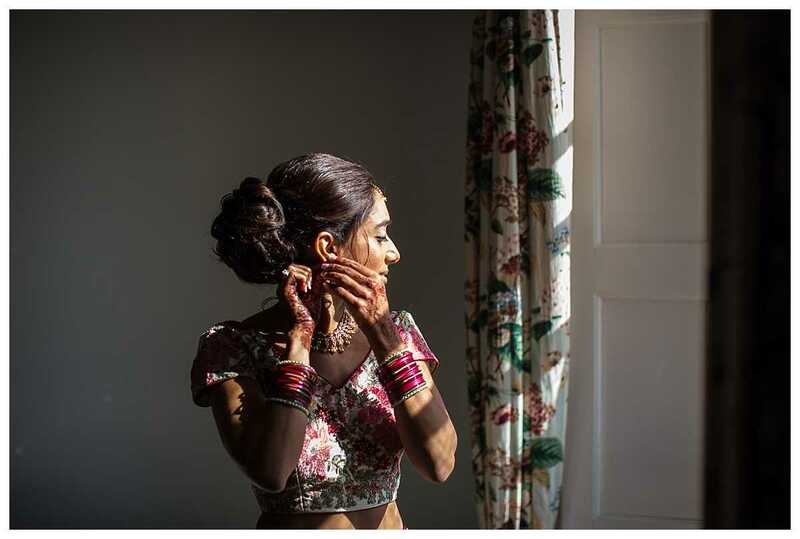 It was a sunny day, which was perfect. 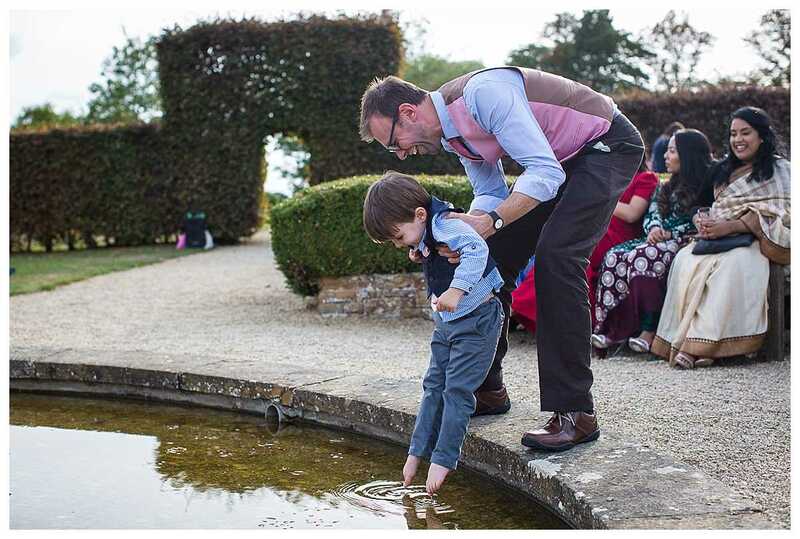 While the guests played lawn games, we also wandered around the venue doing fun and creative portraits as well as the family photos, which I love capturing. 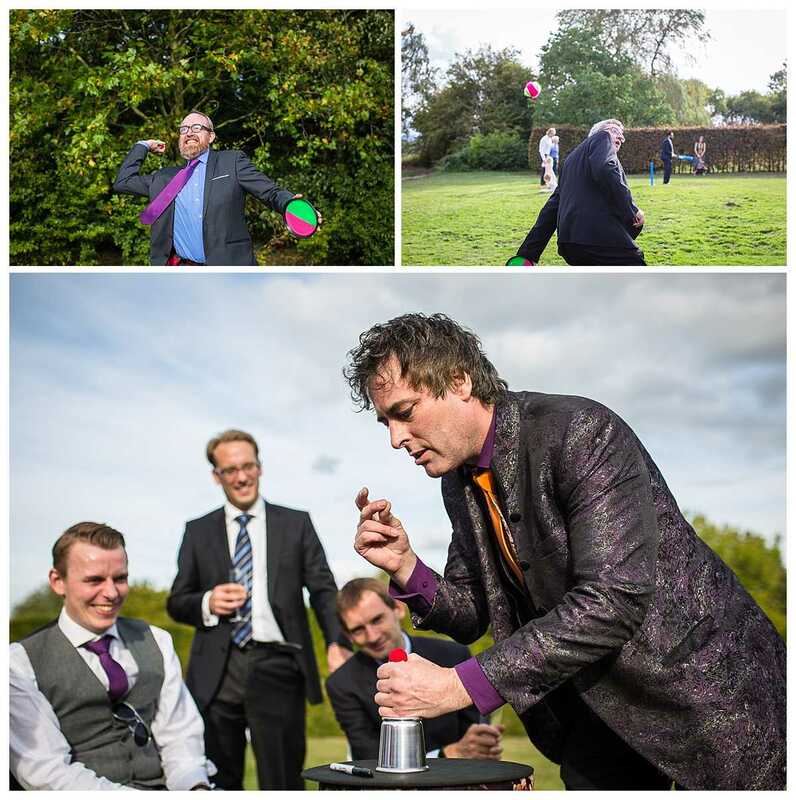 During the reception they played more traditional Indian games too, which went down a storm. 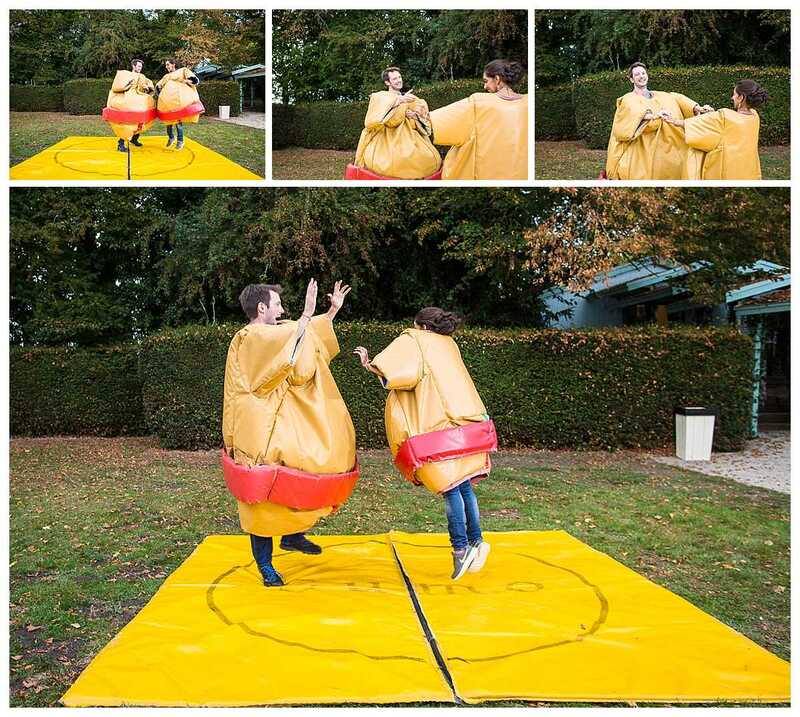 Just before everyone made their way to the marquee for food, Seems and David went for a quick outfit change into SUMO SUITS! 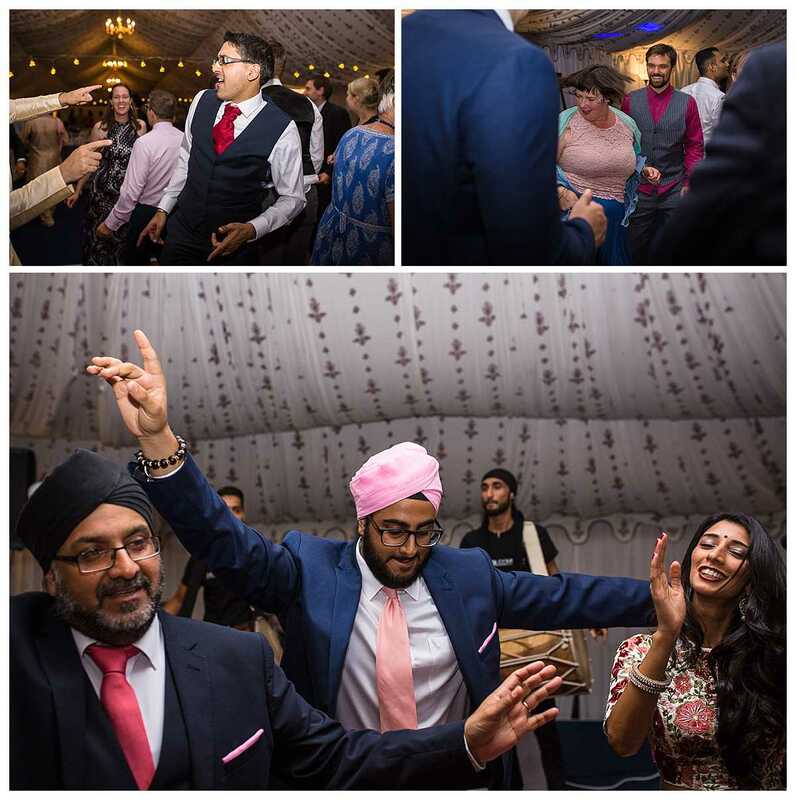 They performed their very comical first dance in sumo suits in front of their guests which had everyone in stitches and was very entertaining and was ace to capture! 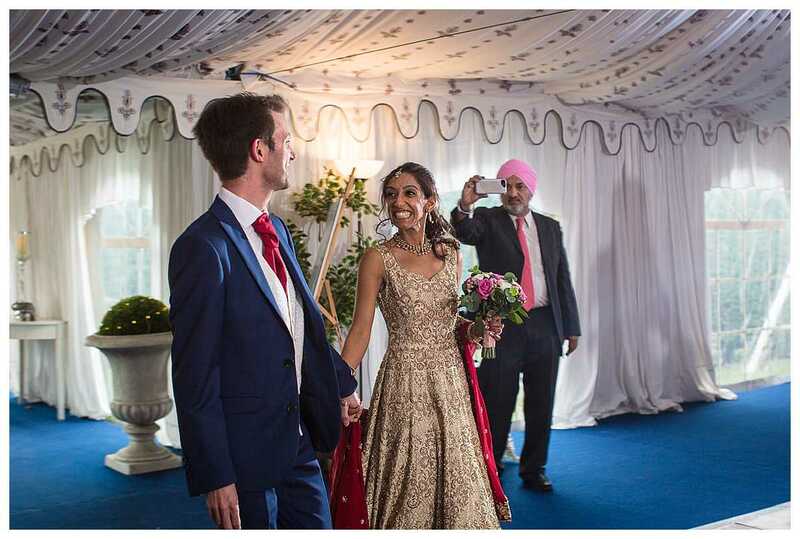 After this our Bride and Groom went for an outfit change. 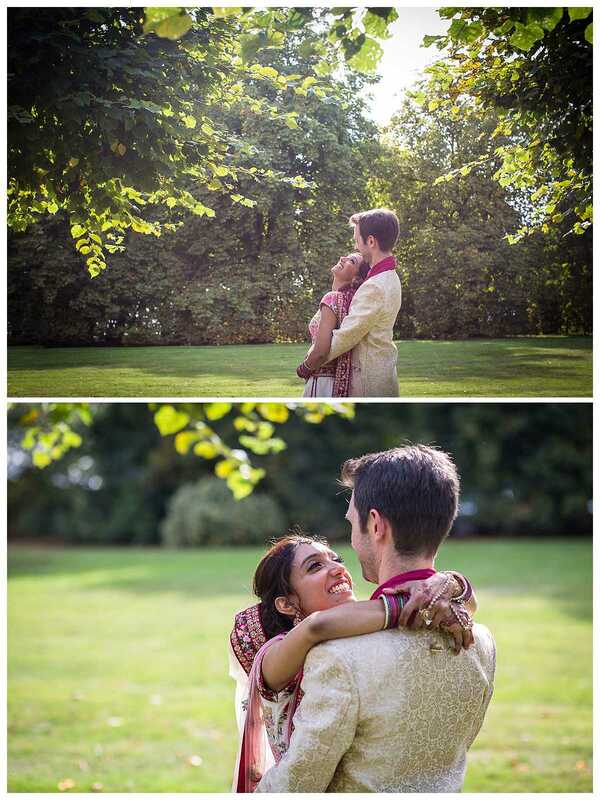 David got dressed into a suit and Seema had another fabulous outfit to dress into too. 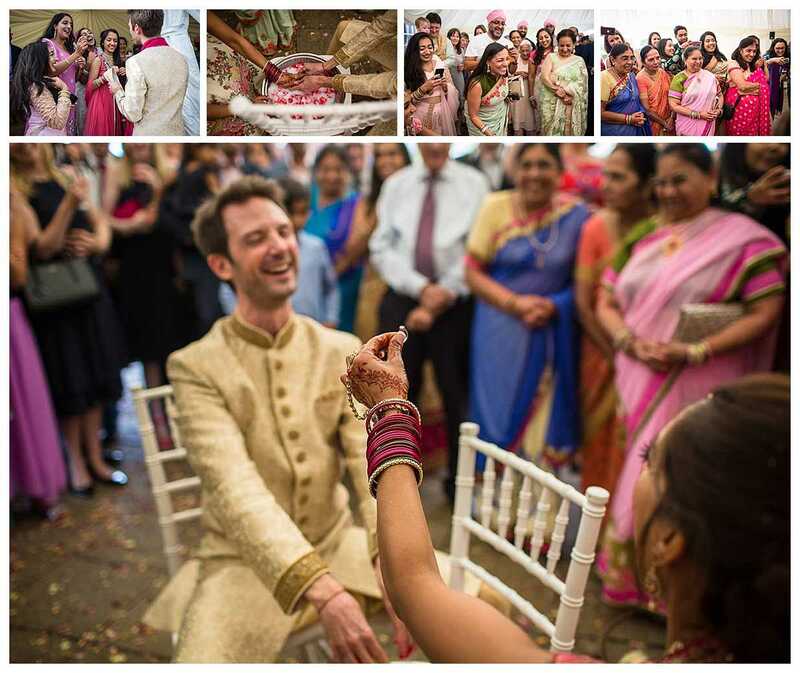 For the wedding breakfast amazing traditional Indian food was served, and it was absolutely delicious. 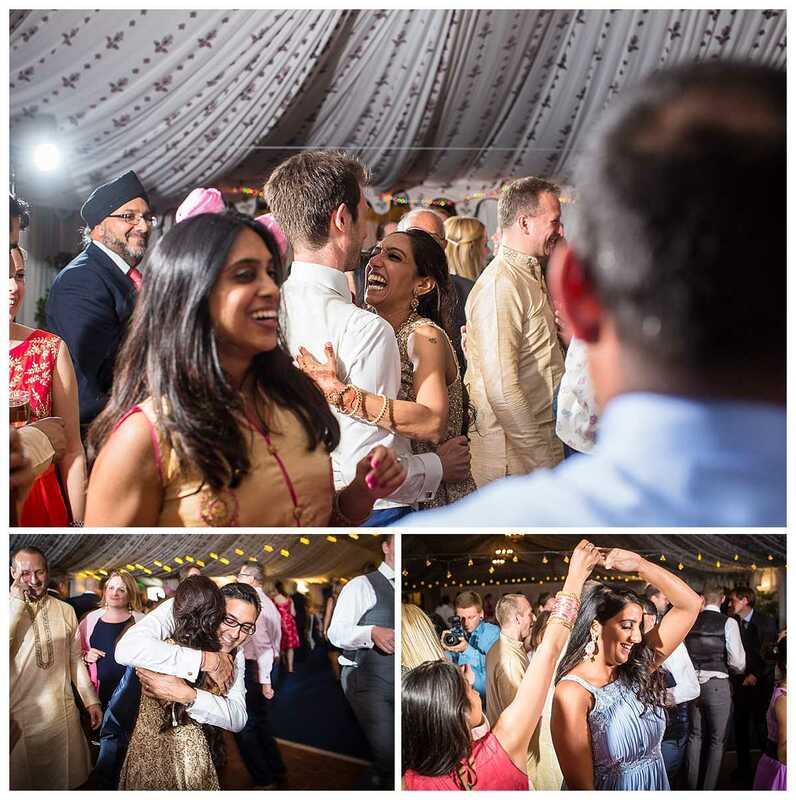 After dinner they had some wonderful speeches and Seema did a speech too, Everyone hit the dancefloor after with some more amazing drumming which really raised the energy levels again and some super beats from the DJ to continue the party. 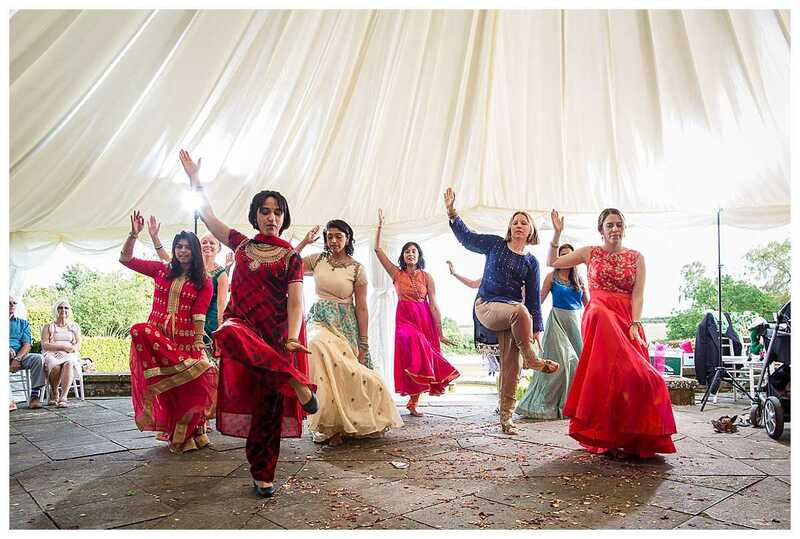 Seema and her friends love to dance! 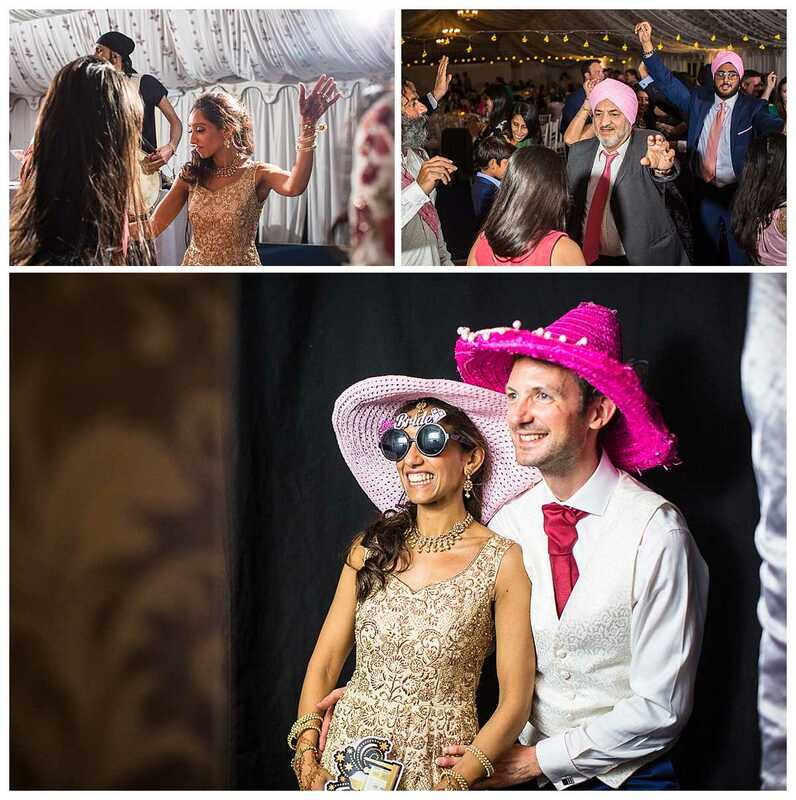 They also had a photobooth, which was a huge hit amongst the guests. 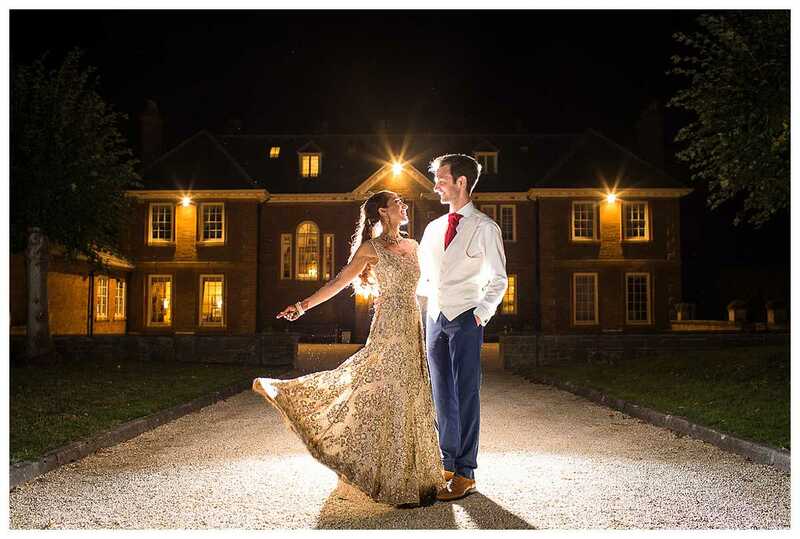 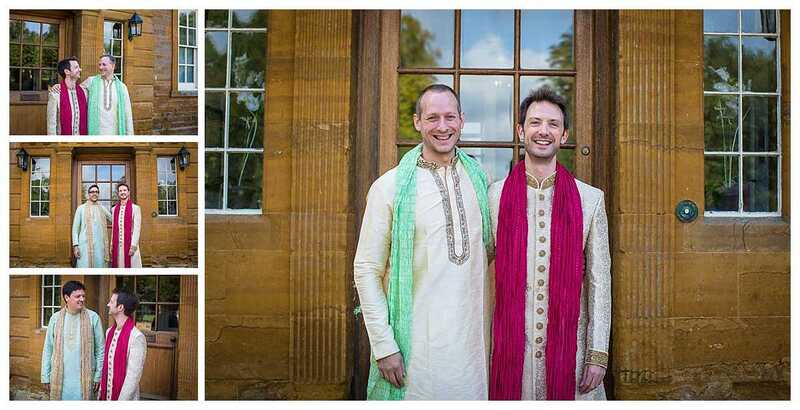 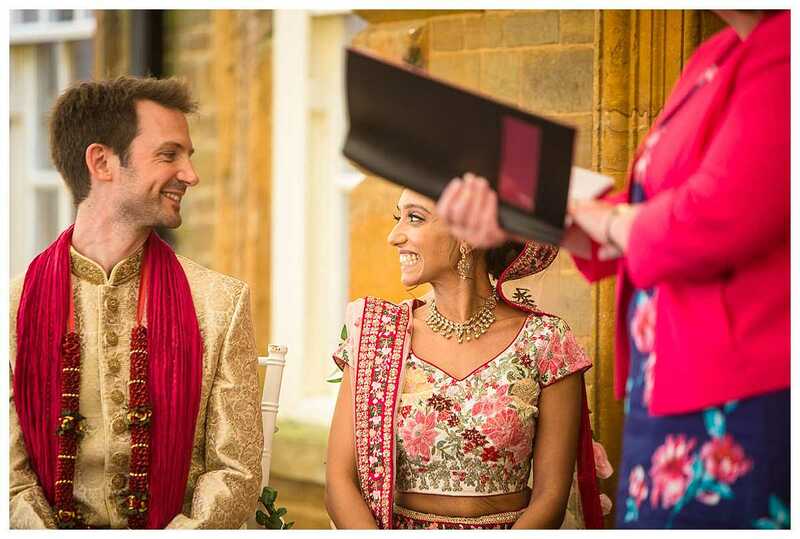 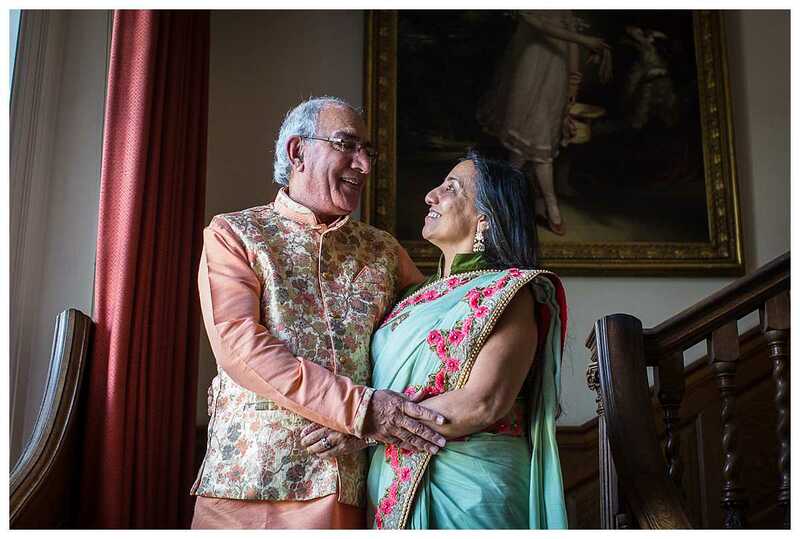 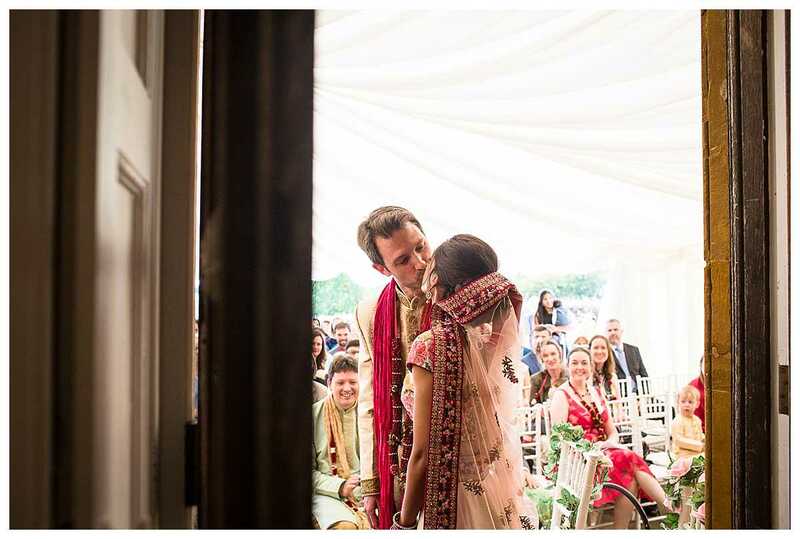 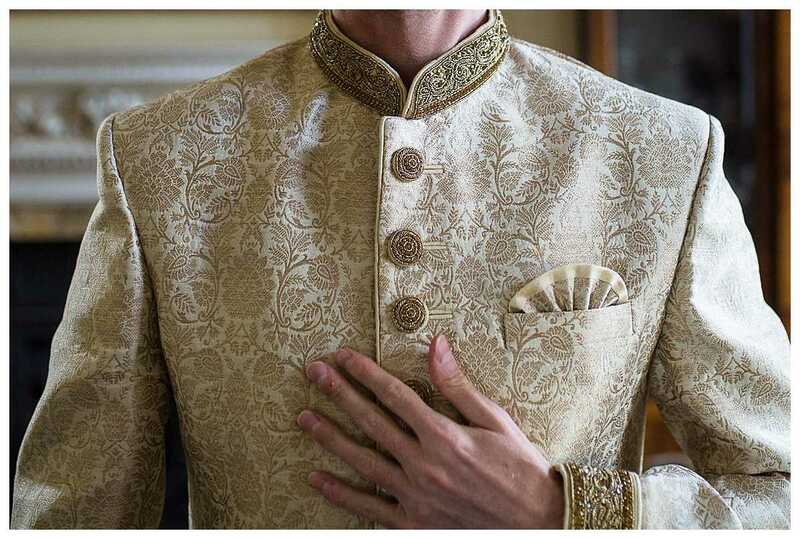 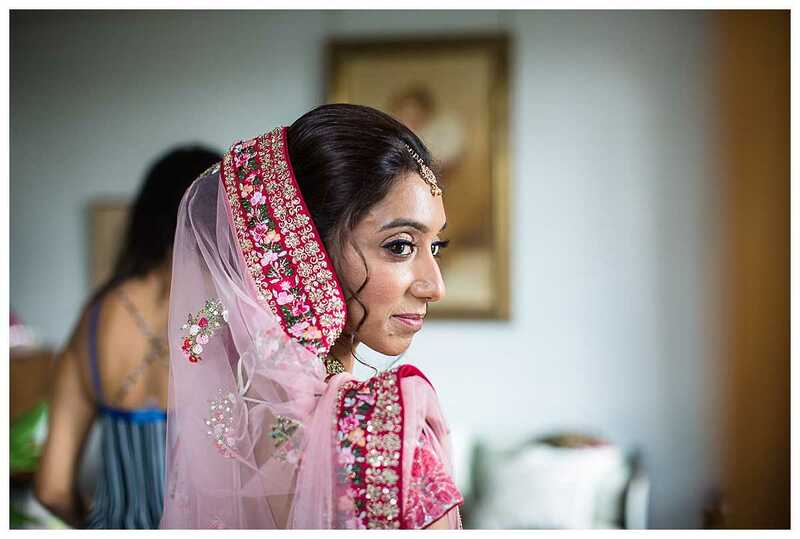 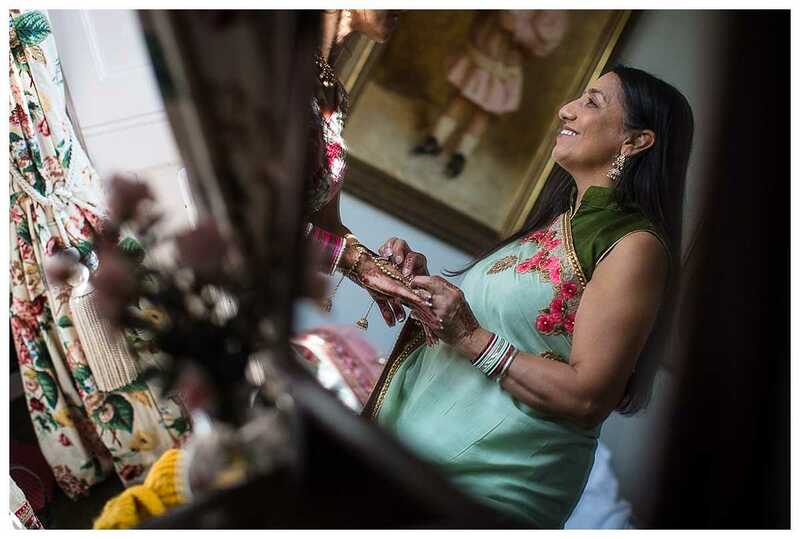 Here’s their beautiful Indian Poundon House wedding!